Can you match your lottery numbers to scoop the jackpot? Lottery-themed scratch with a lucky star multiplier and free cards. Perfect for those who love Lotto and SpinLotto slot. 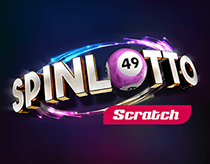 SpinLotto Scratch is a 2 panel card with a set stake value. Match 1 or more balls to win. The lucky star will multiply your win by x 1, x2, x3 or x10. The stake value is set for each card and cannot be adjusted. The stake value is shown on the central ‘play button’. You will also see it appear in the bottom panel as ‘Bet’. To start the game, tap the ‘Play’ button located centrally. This will then change to a Reveal All button. You can choose to reveal each ball by pressing the individually or swiping them. Or press the Reveal All button to do it automatically. The top panel has 5 balls. Press or swipe to reveal your numbers. The bottom panel conceals the 5 winning numbers. Press or swipe to see if any match. On the bottom right is the lucky star. Press to reveal what your win will be multiplied by. For example, if you match 1 number and win a free card, if the multiplier reads x10, you’ll win 10 free cards. Reveal All – if you press the ‘Reveal All’ button, all the numbers will be revealed together. In the event of a win (once the card is complete), the total win value from your numbers and lucky star will be awarded and shown in an animation and added to your account balance. If there is no win, you’ll see a ‘Try Again’ message and the central button will change to ‘Play’ for you to buy another card.